Carbon Offset Chet is our Global Green Pals pilot from England who flies his solar powered plane around the world and meets new eco-minded Pals wherever he goes. He and his Pals are constantly learning, exploring new places around the globe and discovering ways to help the Earth. Chet is the perfect cuddly companion for your special little boy or girl and is great imaginative gift for everyone who cares about the planet. 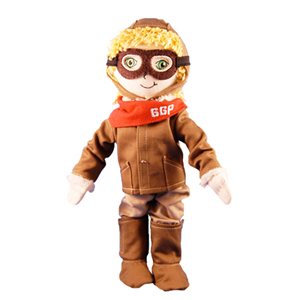 Chet comes fully accessorized, wearing a removable t-shirt, bomber jacket with hood, matching pants, boots, red bandana and aviator goggles.